Welsh trainer Peter Bowen is hoping to have three runners in Saturday’s £700,000 John Smith’s Grand National - Ballycassidy, McKelvey and Dunbrody Millar. The last-named is currently 46th in the weights and therefore needs six to drop out to get a run in the big race at Aintree. Betfair, the official betting partner of the John Smith’s Grand National meeting, offers 74-1 about Ballycassidy, with McKelvey at 24-1 and Dunbrody Millar on 319-1. Bowen, aiming to provide the first Welsh-trained winner since Kirkland in 1905, said today: “Ballycassidy ran very well last year and was a bit unlucky to come down [at the 25th fence - Valentine’s second time round] and you do need luck in the John Smith’s Grand National. “To be honest, though, he hasn't been in quite the same form this year and of course he's an 11-year-old now so that might count against him. He won’t have a problem with the going. At the moment, we don't have a jockey confirmed. “McKelvey stays very well and jumps great. He took very well to the Grand National fences when we ran him in the totesport.com Becher Chase (sixth to Eurotrek) at Aintree in November and, after that, we laid him out for the race. “He's had just one spin since over hurdles at Bangor last month, which he won. The ground will suit him perfectly. Tom O'Brien takes the ride. Trainer David Pipe, based on the Somerset/Devon border, today confirmed that he will run both Celtic Son and Puntal in John Smith’s Grand National. The trainer, who is having his first runners in the great race, said: “Puntal ran well last year [sixth] and he does rise to the big occasion. The ground won’t bother him at all and the better ground will also suit Celtic Son who is a bit of an in-and-out performer and there has to be a question mark about his stamina too. Puntal is on offer at 239-1 with Betfair, while Celtic Son is priced at 369-1. Alan King is likely to be double-handed with Kandjar D'Allier and Tikram in Saturday's John Smith's Grand National at Aintree. The former, who was trading at 119-1 on Betfair today, was well beaten on his last start in the Red Square Vodka Gold Cup Handicap Chase at Haydock in February but won the Sodexho Prestige Tommy Whittle Handicap Chase at the same venue in December by half a length from Wild Cane Ridge. King believes that the heavy ground was to blame for Kandjar D'Allier's poor run last time out. Tikram, a 219-1 chance with Betfair, won the Racing Post Plate at the Cheltenham Festival in 2004 when based with Gary Moore, but was a disappointing 12th in the same race last month. The trainer did not want to speculate about which of his representatives holds the greater chance. Irish trainer Charles Byrnes believes that Cloudy Bays has “an outside chance” in Saturday's John Smith's Grand National. The 10-year-old was last seen in action when falling at the fifth obstacle in the Pertemps Final Handicap Hurdle at the Cheltenham Festival and on Tuesday morning was trading on Betfair at 439-1 for the world’s premier steeplechase. The handler is unconcerned about the current good ground, despite the fact that seven of Cloudy Bays’ nine career successes have come when the going description has been soft or had heavy in it, although he is not sure whether his charge will stay the four and a half miles. Byrnes has already won two major prizes this season with Cailin Alainn and would love to maintain the fine record of Irish-trained horses in the John Smith’s Grand National in recent years. 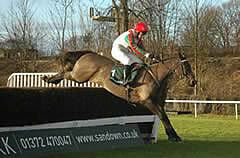 Gallant Approach, a 229-1 chance with Betfair, will run on Saturday if the going remains at good. Trainer Charles Egerton said about the eight-year-old: “He's a maturing horse, a stayer with the speed too when he needs it. He won well at Newbury in November and then I may have bought him out a bit soon when he finished only third at Haydock behind Kandjar D'Allier in the Tommy Whittle Chase. The ground was bad that day, so it could have been the going that beat him.